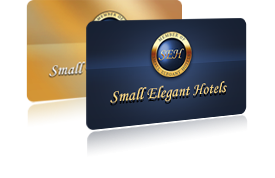 Small Elegant Hotels offers a network of beautiful independent hotels with a maximum of 150 rooms. Every hotel is hand selected based on quality, atmosphere, personalized service, and amenities offered. Over 350 hotels are showcased with pictures and information to better visualize the wonderful experience they have to offer. We invite you to explore the variety of hotels and advantages we have awaiting you around the world.